A Mother and her child’s compact lives revolve around a “Room” that is their entire worlds. The film is the touching exploration of the boundless love between a mother and her child. After Seven years of kidnapped solitary for Ma (Brie Larsen), she decides that enough is enough for her and her child Jack (Jacob Tremblay), and their enclosed surroundings by her kidnapper, the father of five year old Jack. The Room is all that Jack has ever known, but his world is turned upside down when his eyes are opened to the world outside that he is learning for the first time. As he experiences all the joy, excitement, and fear that this new adventure brings, he holds tight to the one thing that matters most of all; the bond to his Mother, who has literally been his teacher and protector for every day in his life. 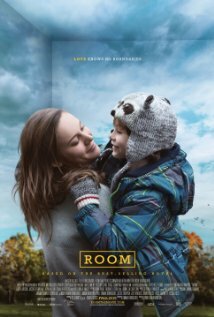 What “Room” does emotionally goes miles beyond a script that is heartpoundingly intense, it crafts a story that is a child’s entrance into the real world, and metaphorically acts as his first steps into such a discovery. Simply put, if “Room” doesn’t move you emotionally, then you should seek a doctor to make sure your soul is intact, because this movie is phenomenal. There were so many things about the movie that i want to talk about, as it’s all perfect technically and acted accordingly. On the latter, the performances in this movie will grip you to tears. Larsen gives the performance of her young career, and this movie showed a side dramatically of her that I’ve never seen before. The relationship between Larsen and Tremblay feels natural in it’s simplicity, but made complex in in the many layers of a story peeled back slowly one layer at a time. The film proves that there is no relationship quite like the one of a Mother and her child, and together they can make it through any nightmare. Larsen harrowingly encapsulates every reaction to her Motherly duties, and her performance feels most honest when she sacrifices herself to protect young Jack. While this isn’t Tremblay’s first feature film, this is quite the coming out party for the boy wonder, as he was leaps and bounds the very eyes of this film. I will get more to beautiful camera work of this film later, but many of these scenes we are experiencing physically and creatively through his point of view with the camera. The story follows Jack more than any other character, and i think that says a lot with the kind of faith that director Lenny Abrahamson has in his young prodigy. One of the biggest problems with kid actors is that their performances often feel wooden or forced, but Tremblay’s innocence will merely be the appetizer for a main course that will have your heart pulled in ten different directions. Jacob’s eyes tell the story of everything that he’s thinking, and in a story that revolves around confinement, his emotional response is always played out in the open. It’s quite spellbounding to see him discover things that he hasn’t even dreamed about for the first time. It makes for some of the very best moments of a two hour thought provoker. The film’s first act is definitely the peak of the film, and that’s not to say that the rest of the film is weak, but the true genius of the film is the things you might not pick up on right away. The shot composition of the film was used very intelligently. Every single shot in the film’s entirety is used for a bigger picture creatively in the limited space of the film’s setting. The movie opens up with a lot of tightly shot close ups of the every day culture and surroundings of these two’s lives. The room feels so much bigger because of the close ups to characters that always put us right next to our two main characters. In more ways than one, the room feels like the real world in the first act, and everything outside of it feels artificially fake, because it’s only seen through the television that is in the shed. It’s very genius of this film’s art direction to never show us the audience anything from outside until it is absolutely necessary. This will earn a bigger response emotionally from it’s audience when we see Jack’s first look at the immense sky that he seems mesmerized by. MINOR SPOILER – There is a part in the film’s finale when the two return to the room as a final goodbye. It’s interesting how now everything feels smaller in the shed when compared to the endless possibilities of a world that Jack is still learning. Abrahamson crafts this by wider shots, as well as visual symbolism for just how empty the room is of all of it’s objects which have been taken by police for evidence, now that the love of the Mother and Son have left the premises. The screenplay is also something that creates a balloon of tension, and makes the audience walk on top of it while trying to keep it from popping. The escape scene in particular was some of the most gut-wrenching cinema that i have seen in 2015, and this is magnified by a musical score that narrates the danger of this boy’s only chance for freedom for he and his Mother. Composer Stephen Rennicks tiptoes around these scenes where it feels like the floor beneath us is going to cave in, but then magnifies his instruments effortlessly when the triumph pays off. Rennicks worked with Abrahamson on his 2014 film “Frank”, and they are quickly moving up the ladder as one of Hollywood’s greatest on-screen 1-2 punch combos. One thing that greatly pleased me was how this film didn’t fall into the clutches of a made for Lifetime Television movie. Ma finds out quickly that even though the two have left the room physically, they may never leave the room psychologically. This kidnapping has an effect on so many people, and we the audience don’t ever truly think about it until those scenes when everything is supposed to be alright. Some of the greatest tension for the movie is definitely in the reconcilliation of Ma with her parents, including a chilling scene of argumentative dialogue between Ma and her Mother (Played by Joan Allen). Leaving the room is definitely only the start of the film, and you realize this when there is still an hour of the movie when Jack escapes. I don’t feel like i am spoiling anything here because if you saw the trailer, you know i am not revealing anything that you shouldn’t already know. The outline is certainly there in the trailers, but you will want to watch this movie for the sorrow that spins a web of psychological precision that is every bit as crushing as it is triumphant. “Room” is a story about much more than the desire to carry on. It’s a story about the relationship between two people when they are all they have in the world that is created for them. As a son with an amazing Mother, i can honestly say that Abrahamson film warmed the areas of my heart that have been frozen for years. He constructs an adults tale seen through kids eyes, and it makes for one of the very best films of 2015. Unbelievable review, Chris. I could feel tears well up in my eyes just reading your review. I will most definitely find a way to see this one. I wonder if the premise of the movie came from the horror in Cleveland. And how did I have no idea a movie happened in Akron? Thank you so much Vickie. You are one of my most dedicated readers. The film is based off of the novel by an Irish author. The film is oddly enough centered in Akron, but the book never has a location. No relation as weird as it seems to the events in Cleveland. The funny thing is I had no idea until I saw the movie that it was based in Akron. Thank you so much for reading Danielle. Korey and Martin are my two biggest influences, so I definitely need to build up the courage to tackle that mountain. How cool to witness a 10/10 with you! Great review. Was thinking while watching it how it would come together. Nicely done. The boy made that movie. Agree totally Megan. Tremblay is a star in the making. So great to hang out with you and watch one of the best films of the year. Very good analogy Eileen. I couldn’t agree more. Thank you for reading.